Masters of German clock making since 1912. Oakside is proud to be the UK Distributor and Certified Online Shop for Kieninger of Germany - you can view their complete range of Floor, Wall and Table Clocks using the menu at the top left of this page. Frank will be pleased to advise you about clock specifications and the Kieninger & Oakside product warrantee. 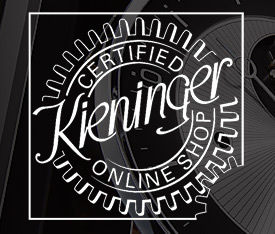 When buying online please be aware that the Kieninger clock warranty has to be administered by your supplying dealer - we will only provide a warranty service to customers who have purchased from Oakside. Kieninger provides a two year warranty on their clock movements and Oakside extends this for a further three years. Kieninger frequently produce their clocks as Limited Editions and all of the clocks that are supplied by Oakside are factory fresh and assembled to the very latest specifications! Delivery times vary but when we receive your order or enquiry we always seek a delivery forecast from Kieninger and advise you accordingly - should the forecast delivery date not be acceptable, we will immediately refund your full deposit. SELF INSTALLATION. The shipping carton will hold the fully assembled clock cabinet together with the Kieninger instruction manual. If your clock has weights and a pendulum, these will be packed separately - just follow the printed instructions which have photos showing how to install these items and you clock will be ready to run. Please remember that you can call Frank for advice when installing you clock. AFTER SALES SERVICE. Kieninger recommend that their clock movements are Lubricated every five years and Cleaned every ten. Frank now undertakes Servicing and Repairs of any Kieninger Clock movement - please contact us if you would like to make a booking. 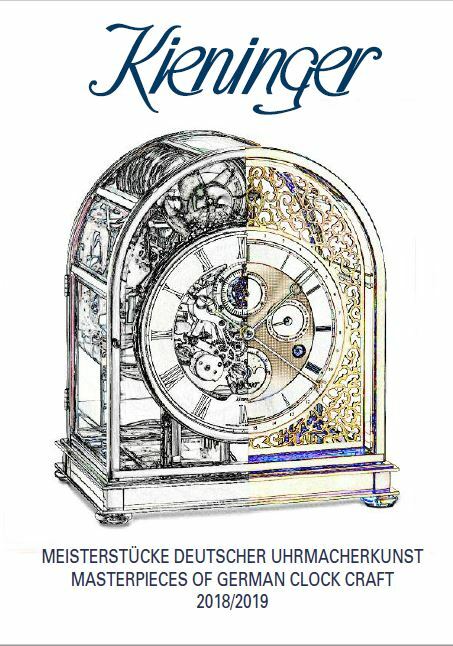 Click on the image on the left to view the New Kieninger 2018-19 Clock Catalogue in PDF format (3.95 MB). The clock descriptions are in German and English. If you have seen the Kieninger clock of your choice at a lower price elsewhere, or you want to make a price offer, simply submit the Contact Oakside form with your details and price offer and we will do our very best to please! When buying from Oakside and you will receive the benefit of our many years of technical experience in clock making - this Personal service and knowledge just isn't available from discount online warehouses! Our price includes VAT and delivery to your address PLUS the 3 Year Kieninger Mechanical Parts warrantee administered by Oakside Classic Clocks. Please Log in to your Account prior to proceeding to the Options & Prices and Quote pages. To register as an Trade Account Customer, please Contact Oakside . Classic English style Grandfather clock. Manufacture of this model has now been discontinued by Kieninger and Frank has purchased their remaining stock. Cabinet in Antique Walnut with contrasting trim, 2 doors fitted with bevelled crystal glass, elaborate brass moon dial with Arabic numerals, a subsidiary dial for seconds indication and completed with applied gold plated decorations. Fitted with a black stick pendulum with a 165mm polished brass bob. Fitted with the KS 057 movement. Kieninger 0105-23-01 - In stock at Oakside. .. If you have seen this model at a lower price elsewhere, we will price match ..
Click here to view the Kieninger 0105-23-01 Clock Details page. Click here to view the Kieninger 0105-23-01 Options and Prices page. Fitted with the Kieninger KSU55 triple Automatic sequencing triple chime movement which plays the Westminster, Whittington and S . Michael chimes and Strikes the hours on a nest of nine brass bells. Classic English style Grandfather clock. Manufacture of this Walnut model has now been discontinued by Kieninger and Frank has purchased their remaining stock. Fitted with the KSU 55 movement. Kieninger 0105-23-02 - In stock at Oakside. Click here to view the Kieninger 0105-23-02 Clock Details page. Click here to view the Kieninger 0105-23-02 Options and Prices page. Kieninger 0105-31-01 Grandfather Clock with Westminster Chimes on a 8-Rod Gong is a classic English style grandfather clock with a case in mahogany with and maple inlays, 2 doors, beveled crystal glass, elaborate brass moon dial with second indication and applied gold plated decorations, Arabic numerals and polished 16,5 cm second pendulum. The clock has an 8-Day power reserve, KSU55 4/4 cable movement, triple chime (Westminster, St. Michael and Whittington) on 8-rod gong with 6 bronze bushings, automatic chime sequence, cable-wound precision movement with automatic beat adjustment (the clock will continue to run, even while you are cranking the weight cables), power maintenance, true second and automatic night time shut-off. Click here to view the Kieninger 0105-31-01 Clock Details page. Click here to view the Kieninger 0105-31-02 Clock Details page. Click here to view the Kieninger 0105-31-02 Options and Prices page. Kieninger 0105-31-05 - 0 Delivery about two weeks directly from Kieninger. Click here to view the Kieninger 0105-31-05 Clock Details page. Click here to view the Kieninger 0105-31-05 Options and Prices page. Continental style Grandfather clock in antique Walnut finish with burl overlays, door with bevelled crystal glass, glass sides allow a full view of the movement, moon dial with applied Arabic numerals and second indication, 270mm lyre pendulum. Fitted with the MSU 09 movement. Kieninger 0107-23-01 - 0 Delivery about two weeks directly from Kieninger. Click here to view the Kieninger 0107-23-01 Clock Details page. Click here to view the Kieninger 0107-23-01 Options and Prices page. Fitted with the HTU 06 movement. Kieninger 0107-23-02 - Please request a delivery forecast. Click here to view the Kieninger 0107-23-02 Clock Details page. Click here to view the Kieninger 0107-23-02 Options and Prices page. A special piece of craftsmanship and fine wood work for collectors and clock enthusiasts. Classic case with hand polished black finish, front door featuring curved bevelled glass trimmed with hand polished black profiles, polished Temperature Compensation pendulum with precision adjustment, silver plated full calendar dial and hand-milled blue Breguet-style steel hands complete this clock. The clock is limited to 250 pieces. Fitted with the RS 001-MK movement. Kieninger 0111-96-03 - 0 Delivery about two weeks directly from Kieninger. Click here to view the Kieninger 0111-96-03 Clock Details page. Click here to view the Kieninger 0111-96-03 Options and Prices page. Fitted with the KSU 33 movement. Kieninger 0117-82-01 - 0 Delivery about two weeks directly from Kieninger. Click here to view the Kieninger 0117-82-01 Clock Details page. Click here to view the Kieninger 0117-82-01 Options and Prices page. Click here to view the Kieninger 0117-82-02 Clock Details page. Oakside os proud to offer you the 2018 Executive version of this superb clock. Sophisticated Ultra Modern Longcase Clock with a Fully Glazed cabinet that displays the Superb HTU Chrome plated movement with its nine Chrome plated tubular bells all illuminated with an over-head interior halogen lighting unit. The front door is fitted with a slightly curved glass. The dial is made of transparent float glass and decorated with Arabic numerals and a secondary dial for seconds indication and illuminated from above by three spot-lights. The time-keeping is managed by a High-grade Temperature compensation pendulum with precision adjustment. All visible accessory components are solid brass and Chrome Plated. This is a limited Edition and each clock has a unique edition number. Fitted with the HTU 07 movement. Kieninger 0126-02-01 - In stock at Oakside. Click here to view the Kieninger 0126-02-01 Clock Details page. Click here to view the Kieninger 0126-02-01 Options and Prices page. Sophisticated Ultra Modern Longcase Clock with a Fully Glazed cabinet that displays the Superb HTU movement with its nine Gold Plated brass tubular bells, all illuminated from above with three discretely positioned halogen spot-lights. The front door is fitted with a slightly curved glass. The dial is made of transparent float glass and decorated with Arabic numerals and a secondary dial for seconds indication. The time-keeping is managed by a High-grade Temperature compensation pendulum with precision adjustment. This is a limited Edition and each clock has a unique edition number. All visible accessory components are solid brass and are gold plated. Fitted with the HTU 01 movement. Kieninger 0126-06-01 - 0 Delivery about two weeks directly from Kieninger. Click here to view the Kieninger 0126-06-01 Clock Details page. Click here to view the Kieninger 0126-06-01 Options and Prices page. Grandfather clock with an antique Walnut cabinet and with brass column caps, bevelled crystal glass front door, moon dial with etched decorations and Roman numerals and second indication, 27 cm lyre pendulum. Fitted with the MS 002 movement. Kieninger 0128-23-02 - Please request a delivery forecast. Click here to view the Kieninger 0128-23-02 Clock Details page. Click here to view the Kieninger 0128-23-02 Options and Prices page. Elaborately crafted Grandfather clock with bonnet pediment and burl overlays in Antique Walnut finish. 2 doors with bevelled crystal glass, additional bevelled crystal glass doors allow a view of the movement. Matching design of moon dial, weight shells and 270mm lyre pendulum with etched decorations. Kieninger 0129-23-01 - Please request a delivery forecast. Click here to view the Kieninger 0129-23-01 Clock Details page. Click here to view the Kieninger 0129-23-01 Options and Prices page. Elaborately crafted Grandfather clock with bonnet pediment and burl overlays in Antique Walnut finish. 2 doors with bevelled crystal glass, additional bevelled crystal glass doors allow a view of the movement. Exposed metal surfaces in Chrome. Matching design of moon dial, weight shells and 270mm lyre pendulum with etched decorations. Kieninger 0129-23-02 - Please request a delivery forecast. Click here to view the Kieninger 0129-23-02 Clock Details page. Click here to view the Kieninger 0129-23-02 Options and Prices page. Small narrow waist floor clock with a Walnut finish, 2 doors, moon dial with Roman numerals, 14 cm lyre pendulum. Fitted with the SK 015 movement. Kieninger 0131-23-01 - 0 Delivery about two weeks directly from Kieninger. Click here to view the Kieninger 0131-23-01 Clock Details page. Click here to view the Kieninger 0131-23-01 Options and Prices page. Elegant floor clock with a Cherry finish and hand polished high gloss burl decorations, doors, hood and sides with bevelled glass. Arabic dial 24 cm with second indication and hand-milled Breguet-style hands. Special temperature compensated pendulum with precision adjustment. All visible accessories are chrome plated. Fitted with the RS 001 movement. Kieninger 0134-37-01 - Please request a delivery forecast. Click here to view the Kieninger 0134-37-01 Clock Details page. Click here to view the Kieninger 0134-37-01 Options and Prices page. Meticulously crafted, elegant floor clock in hand polished dark Walnut finish with fine chrome steel accents in pediment and base. All bevelled crystal glass. Unique, etched and multifunctional dial with etched rhombic decorations, applied diamond turned chapter rings, Second indication, day of the month, day of the week, month calendar, moon phase feature, blued steel hands and easy adjustment of all functions. Kieninger 0137-22-01 - 0 Delivery about two weeks directly from Kieninger. Click here to view the Kieninger 0137-22-01 Clock Details page. Click here to view the Kieninger 0137-22-01 Options and Prices page. Click here to view the Kieninger 0137-96-01 Clock Details page. Meticulously crafted, elegant floor clock in hand polished black finish with fine chrome steel accents in the pediment and base and bevelled crystal glass. Unique, etched and silver plated dial face and superbly crafted, visible dead-beat escapement (George Graham) with Kieniramic® anchor pallets. Fitted with the RS 008-OA movement. Kieninger 0137-96-02 - 0 Delivery about two weeks directly from Kieninger. Click here to view the Kieninger 0137-96-02 Clock Details page. Click here to view the Kieninger 0137-96-02 Options and Prices page. Impressive, elaborately crafted Walnut case with distinctively curved base and walnut burl and inlays, decorative brass column caps, 2 doors, total of 6 bevelled crystal glasses, elaborate brass moon dial with gold plated fine grid, second indication and applied, polished Arabic numerals, 27 cm lyre pendulum with matching grid. Kieninger 0138-82-03 - 0 Delivery about two weeks directly from Kieninger. Click here to view the Kieninger 0138-82-03 Clock Details page. Click here to view the Kieninger 0138-82-03 Options and Prices page. Impressive, elaborately crafted Walnut cabinet with destinctively curved base and Walnut burl and inlays, decorative brass column caps, two doors, six beveled crystal glasses. Fitted with the superb HTU 06 tubular bell movement. This movement runs for eight-days between winding and it plays three chimes - Westminster, Whittington and St. Michael on nine polished full length tuned tubular bells. The moon dial with calendar mechanism is exclusive to this model and it has applied gold plated decorations and Arabic numerals. Time regulations is by the large Lyre pendulum with matching grid and a 27cm brass bob. SPECIAL OFFER for a limited period - Frank will fit the Kieninger Temperature Compensating pendulum special offer on this clock at no extra costs. This is a numbered edition. Fitted with the HTU 06-MK movement. Kieninger 0138-82-05 - 0 Delivery about two weeks directly from Kieninger. Click here to view the Kieninger 0138-82-05 Clock Details page. Click here to view the Kieninger 0138-82-05 Options and Prices page. Fitted with the GSE 01 movement. Kieninger 0139-26-01 - Please request a delivery forecast. Click here to view the Kieninger 0139-26-01 Clock Details page. Click here to view the Kieninger 0139-26-01 Options and Prices page. Kieninger 0139-96-01 - Please request a delivery forecast. Click here to view the Kieninger 0139-96-01 Clock Details page. Click here to view the Kieninger 0139-96-01 Options and Prices page. New Model - Intricately crafted, Grandfather clock in Walnut. Classic floor clock with the distinctive color contrast of dark walnut finish and noble chrome. Curved, solid wood base and and matching column caps. Beveled door glasses and special widescale side glasses. Elaborately detailed dial in chrome finish and matching style 27 cm lyre pendulum. Kieninger 0141-22-01 - 0 Delivery about two weeks directly from Kieninger. Click here to view the Kieninger 0141-22-01 Clock Details page. Click here to view the Kieninger 0141-22-01 Options and Prices page. New Model - Especially high quality crafted, elegant floor clock in Wa;nut with burl marquetry. All glasses have bevelled edges. Unique dial 24 cm with a finely crafted and visible dead beat escapement (George Graham) with Kieniramic ® pallets. High quality, chrome work and a long pendulum with temperature compensation to control time-keeping acccuracy. The LED lighting high-lights the clock, especially in the room. Similarly, a view through the glazed lower section allows a clear view of the pendulum bob. A clock that sets new standards. Fitted with the RS 011-OA movement. Kieninger 0142-22-01 - Please request a delivery forecast. Click here to view the Kieninger 0142-22-01 Clock Details page. Click here to view the Kieninger 0142-22-01 Options and Prices page. New Model - Especially high quality crafted, elegant floor clock in Black and marquetry. Kieninger 0142-92-01 - Please request a delivery forecast. Click here to view the Kieninger 0142-92-01 Clock Details page. Click here to view the Kieninger 0142-92-01 Options and Prices page. Fitted with the SK 012 movement. Click here to view the Kieninger 0143-23-01 Clock Details page. Slim, elegant floor clock in black satin piano finish with accents from grey burl veneer in base, pediment and back panel. Fitted with the RS 001-GD movement. Click here to view the Kieninger 0193-96-01 Clock Details page. Click here to view the Kieninger 0193-96-01 Options and Prices page.